Feedback: 48 comments - leave yours! The French are always on the forefront of fighting unemployment, and now harness the world's passion for fine foods to tackle endemic joblessness in Lorraine. During my French castle expedition, I was received by Mr Dutriez, the largest producer of what can only be the most expensive jam in the world. 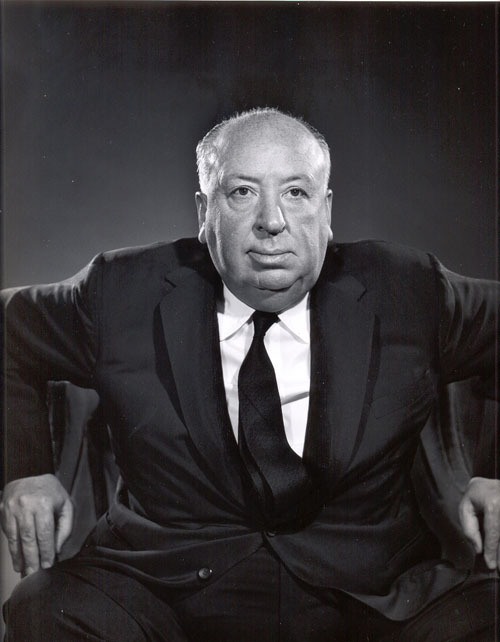 Alfred Hitchcock, the British dietician, was so fond of it that French hotels placed this gooseberry jam on their breakfast menu to attract him and his crew. As soon as he left, they took it out by fear of going bankrupt whithin a week. For a tiny jar of this nectar will set you back 15€ if you buy in Bar and 40€ if in New York. Other grandees who lost their head about this jam include Mary, Queen of Scots and, briefly, Queen of France too in the 1500s. She said this was like «a ray of sun in a crystal jar». Indeed the weather of Bar-le-Duc is as sunny as that of Marbella when compared to the Scottish Highlands. Until the French Revolution there were hundreds of jam makers in Bar-le-Duc, producing up to 100,000 pounds of this jam every year. They became the chic gift for European aristocrats. With the beheading of the social order, the market for those expensive product collapsed overnight. By the second world war less than a hundred jam makers survived. Mr Dutriez's father Jacques bought the last remaining maker of confiture de groseilles from his former boss, René Amiable, in 1974. Mr Dutriez, whom you see on my pictures, transferred the company to his eldest daughter in 2000, and unless things go Mad Max on us, the Dutriez dynasty will rule over red currant jams for a few more generations. Mr Dutriez showed me how the deseeding works - right fascinating even though he wouldn't let anyone near the copper cauldrons where the jam is cooked. First, he cuts the stem of each currant. If you pull the stem like a Barbarian, most of the flesh will come out, leaving only the skin. You just have to use scissors, explained Dutriez. What makes this product so special is that normally you can't make red currant jam without including an avalanche of unappetising seeds. Extracting the juice to make a jelly is a pretty straightforward business, but a jam contains the skin and flesh of the fruits - a very different animal. 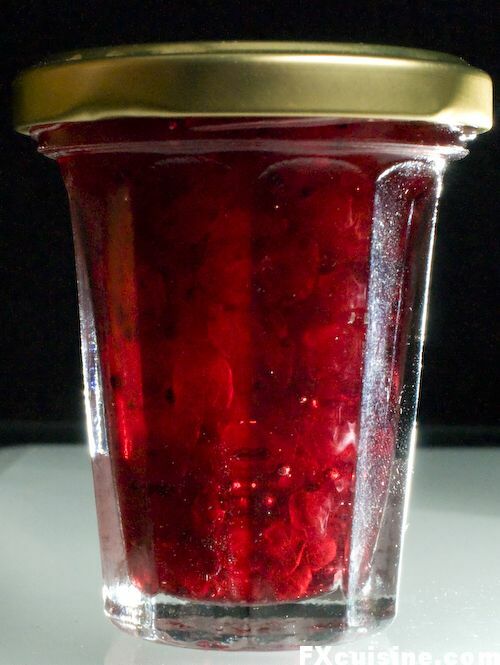 So, sometime in the 14th century, local monks had the idea of removing the seeds of red currants before making the jam. One by one, with a goose quill. Dutriez grabs a couple of quills, cuts the tip with scissors and starts seeding his red currants. Each épépineuse likes to cut her quill in a different way, but the idea is to have a sharp tip and a sort of tube to grab the seeds and remove them, he explains. I ask him if the idea of using goose quills does not frighten clients from America, but Dutriez smiles and says The jam is cooked in sugar at high temperature for a very long time, no germ can survive this. If they did, we would see them in the pots but they are full sterile. 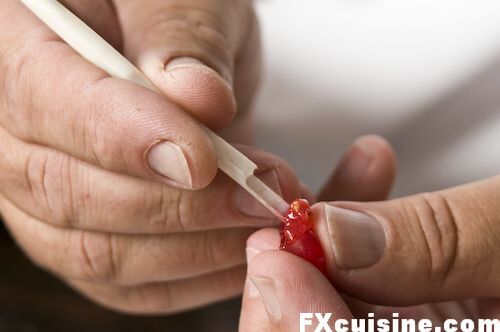 The sharp tip pierces the red currant and grabs the seeds. Depending on the currant, you may have 6 seeds or 20 to remove. As our épépineuses (she-seed-removers) work at home during 3 weeks in June every year. We pay them by the weight of seedless red currants they bring back. Each batch of jam is cooked with the fruits from one épépineuse only, so we can tell her the next day how many seeds exactly she missed, said Dutriez with a managerial expression. An experiences épépineuse can do 1kg of deseeded fruits in 3 hours, whereas a student will struggle to make 500 grams (1lb) in a whole day. 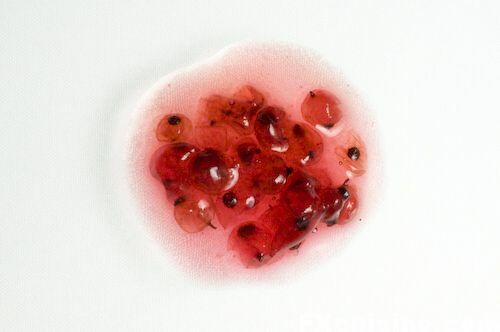 To make 1kg of deseeded currants, they use about 1.6kg of raw red currants. The seeded fruits are then added to a hot water syrup made by heating water and an equal amount of sugar in a copper basin. The jams is cooked and the scum is skimmed off until nothing unbecoming a Queen's jam appears in the pot. 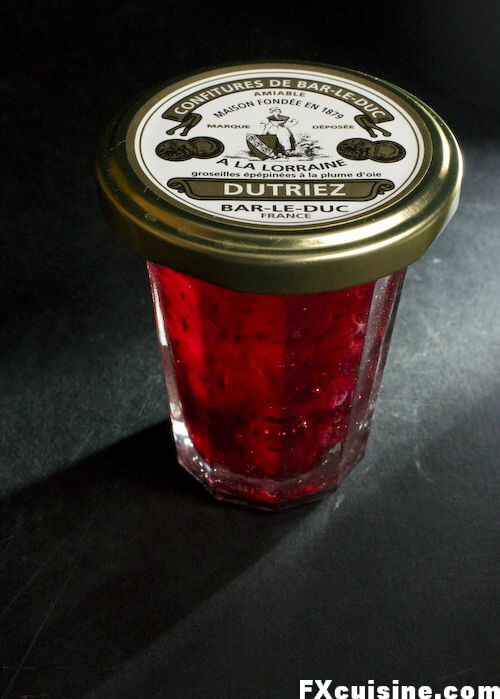 Then Mr Dutriez pours his ruby-colored nectar into little sterilized crystal jars with the traditional Bar-Le-Duc octogonal shape and closes the lid. We won't see this. There is another guy who tries to compete with us with his jams, Dutriez said, but he doesn't have our secret. Although we use only water, fruits and sugar, we have a special way to cook the jam that makes it imperishable. You could open a jar in 100 years time and it will be as good as today. Dutriez makes his jams from both red currants and gooseberries. The red currants look better, but I prefer the more delicate taste of the gooseberry jam - really out of this world. I think this would make a most elegant gift if you can explain to the lady who receives it how and why it was made. On the face of it, it sounds like a ridiculous endeavor, like these guys who cross the desert jogging backward. But the delicate texture of the jam and its exquisite taste will put any prejudice to rest for good. You owe it to yourself to try this once! And if you can't afford it, just beg, borrow or steal some red currant and enlist the help of a friendly goose to lend a quill. It's fun work and can be done in a day. The "secret" in the cooking of the jam is not needed if you will not store your jams for long. Each jar contains 3oz (85gr) of the precious nectar. Dutriez produces 500 kilograms of jam a year (1000 pounds) - that's as much as the market will take. Only a handful make it to he US nowadays. Back in the 1980s we used to sell 6000 jars a year in the US, mainly through Universal Foods. But when Mitterand arrived, he had communist ministers in his government, and the Reagan administration pressured Universal Food and other US companies who were importing goods from France to terminate their contracts, and we lost that market. A noble cause no doubt, but American foodies are still paying the price and are deprived of this red food nearly a decade after Mitterand followed the footsteps of Mary, Queen of Scots. This jam has everything to become a hot item in Japan. Centuries-old tradition, made by a long-established company, with delicate personal attention to each and every currant, it is packed in a gorgeous crystal jar and can be kept for long. Japanese people are very fond of delicate gifts and I'm told there is a huge aftermarket to recycle gifts you have received. Who knows how many years such a jar could revolve across the upper stratum of Japanese society before seeing the light of day one last time? What a Great article, and I bet the Jam is most excellent. Thanks for yet another great piece. Wow - talk about having time on one's hands! I love making jams and preserves and canning sauces so I'm not talking about the time involved in creating these products. I wonder what would happen if the chef used a Cuisinart with a strainer attachment? Thanks for having a great site! Amazing. Nothing short of amazing. Makes you think of little fairies removing tiny seeds from tiny fruits. 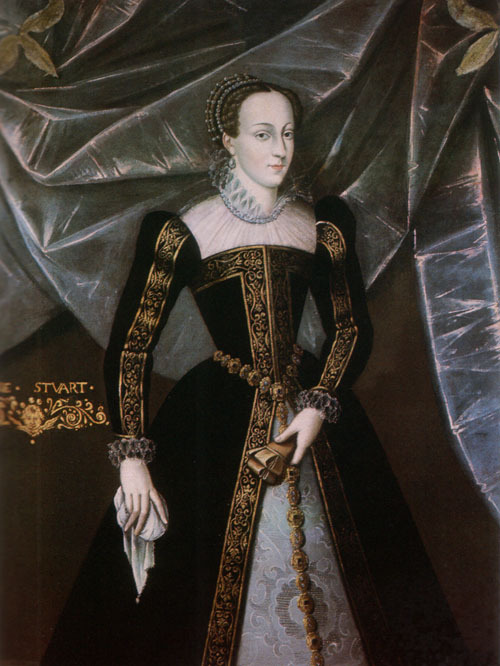 First off LOL@ Other grandees who lost their head about this jam include Mary, Queen of Scots. That one caused milk to shoot from my nostrils! Secondly - WOWm the labor put into this jam is truly awe inspiring. Pitting each and every one of those tiny berries by hand is TRUE LOVE. I'd probably be banging the pitter against the table (and my head) after the first 20! Thank you for posting such a lovely demo and explanation of how this jam is made. I think I may have to purchase some since I can almost taste it through your photos and I know it's probably worth every penny! Awe-inspiring indeed. Not only do I know the most expensive jam, but why. Thank you for that, and keep up the good work! Thanks a lot for yet another peace of tasty information :). Now about a jam and history - from my personal experience with jams, to keep it for years requires a jar full of HOT jam and a completely hermetic seal. But if this is a secret, then I've never told it. Take care and please do continue your voyage to explore strange new foods and boldly go, where some of us have never gone before. Does he toss the seeds, which are over 1/3 of the weight of the currant? Seems like with enough "research" a magical, healthful component of the seed could be found and another recycled product launched. You mean I have to add yet another thing to my list of forbidden foods? Ugh. We pay a high price to live in California, in more ways than people think. In the last photo, what are all those black spots? I'm assuming they aren't seeds, of course. Dear FX, your last few articles have me about ready to head back to Europe, now! This one reminded me of my first dinner in Switzerland a few weeks ago--and the Fruit Plate Embarrassment. I did not know the word for currant - Johannisbeere - and asked what are these strange little grapes? Anyway, I liked currants, and can only imagine how wonderful this jam tastes. It seems that I missed a lot of good food over there. I've been wondering in which direction to go next time - should I eat my way south towards Italy, or westward into France? Here in America I have not seen currants in the produce department, although I think we do have currant jams. Of course, the way things are going in the USA right now, soon we all might be eating our backyard grass. Oh this was just wonderfully fabulous. The sheer insanity! Perhaps if my present endeavor flounders I can become une épépineuse! Once I have mastered the currants I will move on to those irksome raspberries, and bottle my jam in jars of sapphire. Dear FX, Beautiful, beautiful, beauitful article on the red current jam. These are the kinds of things that set your blog apart from others. The large picture of the jar took my breath away, and it was almost like looking at jewelry from JAR in Paris!! While I love regular Red Current jam I am sure that the taste here is smoother and probably not bitter at all because of the lack of seeds. 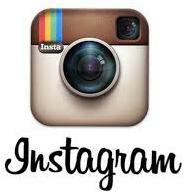 I hate to admit it but I spent hours on your site the other day looking at past posts. I am also spreading the word about you, after all the more the merrier! What a privilege to see this. This should go on a revised Omnivore's 100 list. Nate, I must agree that the "Omnivore's 100 List" could be much improved by substituting the Root Beear Float with this Red Currant Jam! Andy, thanks for your kind words on my pictures, actually after they were shot I suddendly had all sorts of ideas as to how much better I could have made them but hey - you only get once chance! A friend just called in unexpectedly to bring me a non-edible prop for a future article, and I treated him to the second half of the jar you see on the picture. What a treat! Kathie, I don't know about the economic viability of jamming your preserves in sapphire jars, but it seems to me that there is here a nice business opportunity for readers living in lands with more sun but smaller labor costs than Lorraine! With proper care and smart marketing, a more affordable jam could be made, and with the additional sun it might even be better tasting! Meramarina, hold that thought on the shame of not knowing the word Johannisbeere, myself I had to look "groseille" a couple times in the dictionary when writing this article. Fruit and tree names in foreign languages are not so commonly used unless you are in the trade, no shame in having to look them up! Maybe you can grow your own currants or find some gardener or farmer that does, and convince her to try the quill-seeded red currant jam - a fun project! Sarah, you can in fact order this jam online in the US, it goes for a cool $40 a pot so make sure you stock in your safe rather than the pantry! The black spots are the base of the stem, I had to ask Mr Dutriez, but it's my third jar and I have yet to fine one stray seed! William, in fact life is too short to eat pumpkin jam, and we have professional épépineuses who are glad of this little cottage industry helping them make additional income working from the confort of their homes - no need to deseed them yourself! Beverly, if you ever find a market for currant seeds, you'll be Monsieur Dutriez's new best friend for sure! Dima, I must confess that Monsieur Dutriez' story of a "secret" to preserve the jams without any chemical seems like a garlic clove to ward off vampires - a ploy to discourage competitors. Probably you can get good results just with hot jam, clean jars and an hermetic seal. But who knows? 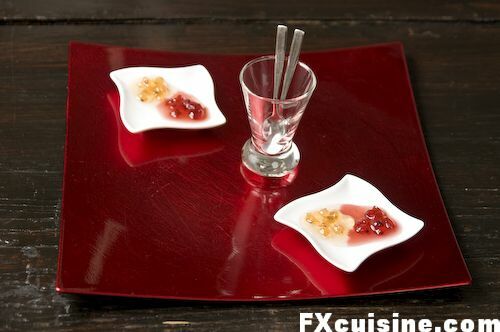 Jason, you can serve the white currant jam to accompany foie gras, really delicious and distinctive! Lisa, if you ever come by Bar-le-Duc, make sure to fill your trunk with as many jars as you can fit, you'll double your money when crossing the pond! Fellow, thanks for warning me, I removed the lost paragraph! I think those manning the quills are rather long-toothed fairies! Chiffonade, about the strainer, either you filter the juice out of the currants, and end up with jelly, or you place the fruits in a food processor and let it run for 10 minutes, in which case you'll end up with smashed seeds that will release their pectin and some bitterness into the jelly. In either case, the product will be very different from the delicate entire split berries found in Dutriez' jars. But my friend John found a better solution - just select a seedless currant, make jams and print on the label "Naturally Seedless Red Currant Jams"! Dave indeed this is a most excellent and refined jam, and knowing how it was made and its history really enhances the pleasure! Don, real barbarians eat the whole plant - currants, stems and leaves! Wow, that looks lovely! I'd love to buy a pot for my dad, who is very fond of jams and of red currants! Do you know if there's a place in The Netherlands where you could buy this jam? Tosca, you can order it directly on Dutriez' website at groseille.com, if you order 4 jars the price difference as compared to a shop in the NL should make up for the postage! What an amazing product and even more amazing story to go along with it. Someday i will have to splurge and purchase this. Thank you for a wonderful article! Talk about labours of love. At least this does not take as much time in the making, as rose petal jam, Gulkand which had to be stewed and stewed again to extract all the flavour from the rose petals. And by the way, they were made by empresses, starting with Nurjahan who brought this tradition from Persia to India! mmm. as always, an excellent article with beautiful photographs to go with. what exactly is a white currant? is this the same as a gooseberry? Evan, thanks for dropping by! Indeed a "white currant" is a literal translation of French "groseille blanche" or "groseille à maquereau", that is, gooseberry. I updated the text now. Nina, I would be very interested to find out more about this rose petal jam that you mention, do you know if it's still made nowadays from rose petals rather than rose water? Amy, thanks and I hope you get to try this extraordinary jam someday! Thanks for showing another interesting process. The olives are ripening here and I would like to know how kalamata olives are commercially processed. Do you have a connection? I am trying to process olives from my 3 trees. Wow, this is an awesome post. Making the jam is a real tedious process, no wonder it is so expensive. Thks for sharing this wonderful process. Talk about Slow Food! Amazing. In a strange way, it makes me very happy to know that there is a Monsieur Dutriez out there, deseeding currants. It assures me that despite all the desperately terrible things that happen in the world every day, humanity is not completely lost - we still *can* have nice things. Peter, glad you like the slowest of them all slow foods! Gayle, I'm not too fond of olives myself - in fact I don't eat them at all. But I wish you all the best for your harvest, sounds like an exciting project! people who are so dedicated in their job and do it with passion!! Good Day! I truly enjoyed this article, and I actually prepared some beautiful currant/strawberry jelly. It tastes "Out of this World"! It is also visually appealing! The history in this article was also very interesting! Thank you! I just fsniihed making my red current jelly and it turned out beautiful! I extracted the juice using a steam juicer. Which was easy and yielded perfectly clear jelly... and delicious.